Hello there! We have a son, Graham, and are expecting twin girls this spring. We’d both like the female equivalents of Graham – classic and familiar but underused – but are having a tough time agreeing. We’d like names that are strong versus delicate or overly girly. We’re open to names that stand on their own, the way Graham does, or names that also have nickname possibilities. 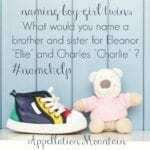 The only names we’ve remotely agreed on are Madeline (my husband’s top pick) and Eleanor, but both are fairly popular (particularly Eleanor) which gives me reservations. Names I like but my husband doesn’t: Florence, Frances, and Matilda. Names I like and my husband is possibly open to: Margaret (I like the nickname Maisie), Fiona, Corrine, and Vera. As far as middle names, we’d like to use Ann – which is my middle name, as well as my mother’s and my mother-in-law’s middle names – and Louise – which was my grandmother’s and my husband’s grandmother’s middle names. Twin daughters – how exciting! Congrats to you + your family. Graham strikes me as un-fussy, a straightforward name that is tough to tie to any particular decade. People recognize it. I mean, everyone knows of a Graham or two, right? And yet it’s not a name that repeats too terribly often. I’d guess that the average Graham might go decades before he has a classmate or colleague by the same name. And yet, no one would ever dismiss it as a name that’s too different. So what’s the feminine equivalent? It’s not Madeline. You sort of know that already, because it is very popular. But here’s the thing about Madeline: it has multiple potential spellings. I counted eight in the current US Top 1000, and I know of at least two more in use on real kids. Madelyn is actually the most common spelling. Tally them all up, and it’s a name that’s been in heavy use for a decade or more. Maisie and Fiona do sound like sisters for Graham. And I think they sound like sisters for each other, too! Actually, lots of the names on your list seem like they have potential. But let’s see if we can think up some fresh ideas. The challenge is this: names like Elspeth and Tamsin seem like obvious suggestions. But they’re a little too different, aren’t they? So let’s see if we can find something slightly more mainstream, without tipping into Madeline territory. Brenna – Back in the day, Brenda was big. Jenna, too, No surprise, then, that Brenna saw some use. It peaked in the 1990s. And yet it doesn’t feel like a 90s name, not the way that Brittany and Ashley do. Plus, it means strength or maybe raven … both of which feel auspicious. Claire – Spare, trim names like Jane and Mae are obvious suggestions. But I think it’s Claire that feels most Graham-like. The challenge here: does that mean that Claire’s sister would also need a single-syllable name? Elise – Evergreen Elizabeth is always popular, but how about gentle Elise? Originally a short form, it stands on its own today. And, like Graham, I think it feels timeless. Another in this category? Ellen, which couldn’t be a sister for Elise, obviously – but does pair nicely with Graham, and substitutes for the more popular Eleanor. Maeve – Sharp, stylish, and under-the-radar, Maeve could be great. Except it’s rising pretty quickly, thanks to a mix of an on-trend sound and a character from Westworld. For the moment, Maeve isn’t even in the US Top 300 – but five years ago, Maeve wasn’t in the Top 500. So it’s possible a Maeve born in 2019 might babysit a bunch of kiddos with her name in another fifteen years or so. Maura – Maura last appeared in the US Top 1000 in 2006. Doesn’t that seem bananas? Like Graham, it has nicely Scottish roots. It’s familiar, but rare. One downside: it might be misspelled Moira, and Moira can be pronounced with an ‘oy’ sound as well as rhymes-with-Laura. I love the idea of Maura and Fiona as sisters for Graham. Teagan – You’ve mentioned that you prefer strong names, and it also sounds like you’re found of straightforward ones. But is something like Teagan too modern and unisex? It seems to fit your criteria, and yet I’m not quite certain it’s your style. One additional thought: have you ever considered naming your daughters Ann and Louise? Or Anna and Louise? Anna Madeline and Louise Eleanor – Because your family names are great, strong, timeless choices that sound exactly right with Graham. Maura Ann and Fiona Louise – They’re a little more conventionally feminine, but not in a frilly way. Vera Ann and Maeve Louise – Linked by that strong, sharp ‘v’ sound. Margaret Louise and Frances Ann – Or how ’bout Margaret and Frances, called Maisie and Frannie? Overall, I’m most curious if you’d consider Louise and Anna. If not, Maura and Fiona seem like a logical pair. But let’s turn it over to the readers, because I know there will be some great suggestions! 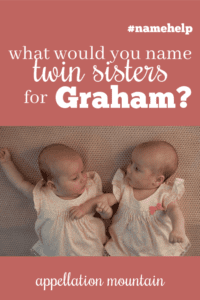 What would you name twin sisters for Graham? 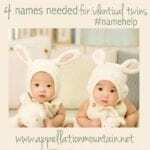 Name Help: Identical Twins – Four Names Needed! I am just now seeing this and am so grateful for the suggestions. Quite sadly, after writing in for name help we lost one of the twins around 12 weeks (which we grieved but have been adjusting to). I decided we should still give her a name – we named her Esme Louise (Esme means “beloved”). Despite our loss, it is still lovely to read through these suggestions – and there are great possibilities for the healthy baby girl we’re still expecting. Thank you. Oh, Kim, I’m so, so sorry for your loss! Thinking of you and yours. I always wanted twin girls and I would have named them Jane and Kate. My father’s name is Graham, his sisters are Christine and Lynette. He has a cousin called Beverley. Some names that were contemporary to Graham to consider. I love Maisie and Fiona as sisters for Graham! What sweet names. If I had been a boy, I would have been Graham, so I’ll also chime in with my name, Julia, which is maybe too popular for your taste (I love my name). My older sister is Freya Louise (I also love her name). Congrats on your twins! How exciting. Strong, vintagey names like Agnes, Sybil, Leona, Rosalie and Marjory seem like they might fit. I think my favorite combos would be Leona Louise and Agnes Ann because I’m a sucker for alliteration. My first thoughts were Alice and Helen(a), both of which have been suggested by other commentors, and I agree that Margaret and Fiona are great. Elizabeth (especially a less common nn like Betty, Betsy, or Liza), Beatriz or Beatrix, and Rosalind or Rosamund come to mind too. I think Wren and Elle are lovely names… simple, strong, original, and very elegant. They would sound magical with Graham. Adelaide, Etta, Haven, and Raina are all stunning names as well. Congratulations on your two lovely girls! I see people have already suggested Daphne. Fiona for some reason just makes me think of Daphne, love them together. Would also like to suggest Annika to elaborate on Anne if that’s not quite doing it for you. Fiona Elise and Margaret June are very strong to me. I think Maisie and Fiona are perfect as sisters for Graham! I would find it hard to resist a Margaret Ann nn Maisie and Fiona Louise pairing, but I also quite the combination of Maura and Fiona. Oh, I do like Margaret “Maisie” and Fiona together! Graham is lovely. I’m surprised no one has suggested Lorna. Graham, Lorna, and Maeve is a fun combo. Mary could also be Maisie and fits the criteria I think. Mary Ann & Jane Louise. Love Graham! I think Margaret, nn Maisie, would be lovely for one of the twins. I like Elise Ann & Cora Louise best of all the suggestions. They are beautiful together and with Graham! 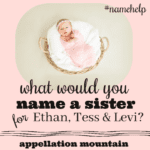 Twin sisters for Graham- I would pick Elise & Tessa! I also think Camille is nice with Graham. It’s one of those names that feels like it could have been born in any decade and it’s not going to take off and zoom up the charts. Plus it’s not overly frilly! From your list I love Fiona & Vera too! Like Graham, Annabel and Catrina have strong Scottish associations. The twins could be called by their full names or “Annie” and “Catie”. Phoebe, Cecily, Evangeline, Esme, Violet, Hazel, Cora, Verity. I LOVE all your ideas!!! Congrats! Some of these may be weirder than you like but hopefully helpful in stimulating new ideas! Also included are my faves from above. I LOVE Gwendolyn: very sophisticated and strong! And wow, I’ve been wanting to name my future son Titus for years! Such a lovely name! Titus is the best, do it! Such a strong name and not super common from what I’ve seen. I think Ann/Anne and Louise would be perfect. Maybe Louise Madeline and Anne Elizabeth?